What is Goal Setting ? Why is it important to have goals in life ? Is it really necessary to have goals in life ? What will happen if i live a life without goals ? These are few questions which needs to be assessed and answered by every individual. Its the power of our dreams that takes us ahead or pulls us back. Goals are very important in life. Until we set a destination for ourselves how will we traverse the path and reach our destiny. With a specific goal we plan a specific path and try to conquer all odds of reaching that goal and persevere till the goal is achieved. We have to dig deep within ourselves and decide what we really want to do ? What is it that will make us happy ? There is a great saying “ If you love what you do, you will never have to work for a single day “. This can only happen when we set a goal and make up our mind to achieve it. This will make our work more enjoyable. 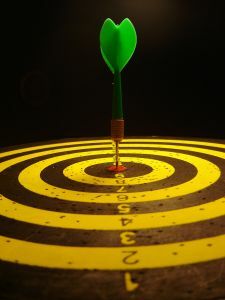 Goal setting is an important part in career development or personal development. One cannot reach a desired destination without specific goals and planning. Look within yourself, have a goal, write it down and read it again and again till it gets embedded in the subconscious mind. This will keep you on track and you will never lose focus of your set goals. A lot of people will comment on your set goals. Turn a deaf ear to them. Its your goal, your life and only you will decide what you want and there is no one in this whole world who will decide for you except your own self. There are lots of articles published online and offline about the necessity to set goals but how many are there who actually set goals and strive hard for it, thinking and concentrating on one specific objective and nothing else. When problems occur over and over again in the path of success a lot of people have the tendency to modify their goal and look for something less which is achievable. Always try for something which is over and above your comfort zone than only you can achieve the unachievable. Our age or educational qualifications will not be a barrier in achieving our goals. If someone without an MBA degree can run a business successfully like Dhirubhai Ambani then anything is possible. Its not the educational qualifications which is barrier to goal setting or our success but our thinking which makes us big or small. I would like to cite a very famous quotation here “ Its your attitude and not your aptitude that determines your altitude”. Just by changing the way we think we can do a lot more than we perceive as possible. Set a very specific goal and keep yourself motivated everyday by reading motivational quotes and motivational videos. Nothing is impossible. All barriers and glass ceilings exist just in out mind and no where else. It is we who impose all sorts of restrictions on us as to what is possible and what is impossible. There is no one else who takes our decisions but we ourselves are responsible for all deeds and actions we take. There are lots of students who just keep on studying without any career goals till they finally think they are employable. These students find it really difficult to adjust anywhere as they have no specific goal. Have a specific objective and try your best and leave the rest on God as “Man proposes and God Disposes”. That is what i believe. We should try our part and do all we can, rest will be happening and a day will come when we all will be living fulfilled life with our achieved goals and set a next one to be achieved.